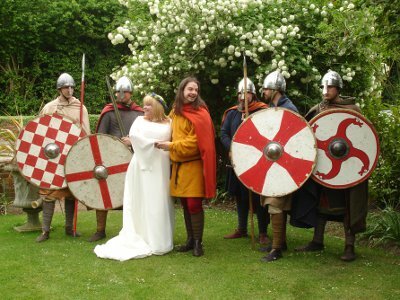 Did you know that Swords would be exchanged at an Anglo Saxon Wedding? 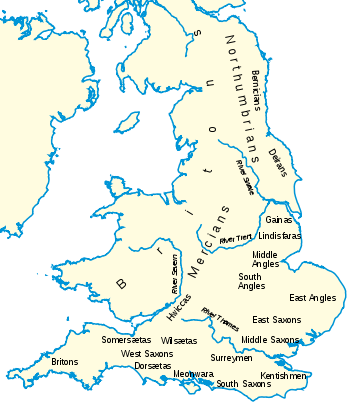 Marriage in the early Anglo Saxon Period was very important as a union between two families. As such it involved a contract or bargain between the groom and the father of the bride. The father of the bride was keen to ensure that his daughter and any children that came from the marriage were secure financially whatever happened to the marriage and the groom in these uncertain times. Thus marriages were negotiated by the parties involved. A man wishing to have a woman in marriage would approach her father (or head of the family). He would go with his friends – especially if they were men of rank and position. The morgengifu or ‘morning gift’ was a gift of money that the Groom gave to the Bride on the morning after the wedding. It was supposed to guarantee that the Bride had some independence of the Groom and would protect the future of herself and her children. This was hers to keep and use the entirety of her life. The handgeld (or brydceap or mund)was a financial or other gift to be passed to the bride’s family at the wedding and was supposed to show that the groom could care for his future wife as well as symbolically make up or recompense to brides family for her leaving them. Daughters brought a certain spiritual luck to a family. They in many ways carried the sense of family and the clan spirit of a family. The brydgifu or the bride’s dowry was to be paid by the brides family and again was to be long to her and to be untouchable by her husband. Like the morning gift it was to ensure, in event of the husband’s death or divorce, that her and her children were provided for. We may associate the Anglo Saxons with being smelly and dirty but prior to the wedding the bride would bathe. If available (probably more common in the Germanic and Scandinavian homelands than in England) she would visit the a sauna or sweat lodge. Her attendants would then dress her in her wedding gown and crown her with the wedding wreath or bridal crown. Just like today she should not be seen by the groom. The groom would also bathe and then dress in his finest clothes as well as strapping on his ancestral blade. On the journey to site of the wedding the bride would be proceeded by a young kinsman (member of her family) bearing a new sword she will be giving to the groom. The groom likewise, bearing his ancestral blade accompanied by the groomsmen goes to the site. The priest officiating the ceremony (the Weofodthegn) would call on the gods to hallow the site and would make a statement as to the purpose for gathering. 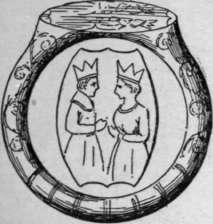 Of the various gods the goddesses Freya and Frigja would be particularly invoked as those most involved in weddings, love, marriage and fertility. “I give you this, the handgeld as I oathed to do.” A few words may be added describing the handgeld. Rings would be exchanged just as to day, oaths given and finally, all of the groom’s keys are given to the bride. The granted her the role as keeper of the household. The woman had ultimate authority on the storage of food and the well being of the household just as the man had the role of protecting the household from enemies. Just as today the occasion of a wedding would be an excuse for a party. The Bride and Groom would share a loving cup to make their toasts to the Gods. Frigja and Freya. These were the most important to toast as they are the goddesses to ensure a good marriage. Now there would be a feast of the best food and drink. Following the feast, there would be music and dancing and the usual entertainments. There is some evidence that in some tribes a race should take place. This was a race by the separate wedding parties to the new home. The party that lost has to serve the other at the next feast. Regardless, of who gets there first, the groom blocks the door, and carries or leads the bride across the threshold. So that tradition goes back a long time. The morning after the wedding, the morgengifu needs to be given from the groom to the bride probably with witnesses. The month following the wedding was called the hunigmona from which we get our modern word “honeymoon.” This was so named because for the next month, the couple would drink mead. So some parts of these ceremonies we recognise today and some are less familiar. This article has taken material from the very useful http://www.englatheod.org website. That site studies and recreates ancient tradition of the years before the Christian Church replaced the Pagan religions of the Anglo Saxons. The process of pregnancy and childbirth in the darkages was fraught with danger. There have been estimates that around 10% of childbirths lead to death to mother or child. Deprived of effective medicine our ancestors therefore relived on superstition and belief in the gods. We know about Anglo-Saxon cures and treatments and advice for health in pregnancy because of Leechbooks (a sort of compendium of cures) which survive into the modern period. Probably due to widespread malnutrition in pregnant mothers, infertility was a commonÂ problem. There was no Â IVF (‘test tube babies’) in these days and no way of determining the cause. If a marriage did not lead toÂ pregnancyÂ there were however steps that a woman might take. Firstly if all else failed the laws of Alfred the Great allowed her to lay aside her husband if she did not become pregnant. 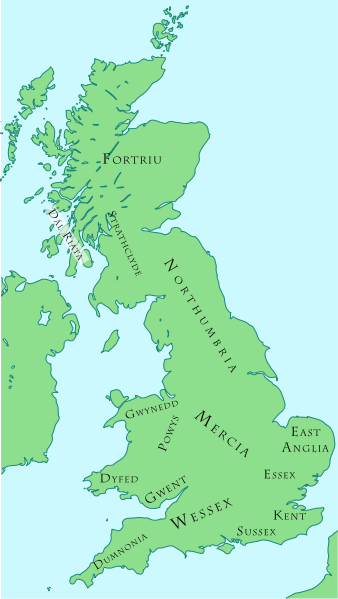 Those laws date from a later period in the Anglo Saxon period but may have reflected earlier traditions. Anglo Saxon medicine was crude BUT could be effective where a easily identified cause and treatment could be decided upon.Â UnfortunatelyÂ in the case of infertility (and miscarriage) the treatments fall into the realms of superstition. The use of charms and spells to try and produce Â a pregnancy was common place. For example a woman who could not get pregnant would be advised to wear a hart’s Â rib on her arm. Or she might try slicing up a hare’s belly and mixing it into a drink. Another approach was to eat mushrooms and to rubÂ herselfÂ all over with oils rather than bathing. Still another advised wearing coriander tied to the woman’s leg. GeneralÂ advice regarding diet and behaviour in pregnancy was Â given. Pregnant women, particularly those with threatened miscarriages, should avoid riding horses and strenuous activity (pretty much all we can advise today). They should not eat sweet or salty food. They should reduceÂ alcoholÂ intake. Possibly the restriction on sweet food came aboutÂ becauseÂ Anglo Saxons doctors and midwives could taste the sugar in some pregnant women’s urine (sounds gross, no doubt, to the reader but before modern testing sticks this was a method that had to be used until quite modern times) and and realise there was a problem.Â TodayÂ we would call it gestational diabetes. In later period whenÂ ChristianityÂ had replaced paganism pregnant women were advised to write a prayer in Latin on a wax tablet and tie it to the sole of their right foot. It seems that it was more likely to cause them to limp then protect their pregnancy! OneÂ remedy for a threatened miscarriageÂ specified in an Old English document instructs the woman to drink the heart of a hare, ground into dust and sprinkled with frankincense into a goblet of wine. She would have to drink this for up to thirty days. This remedy would be very expensive and completelyÂ ineffective. Risk to the soul: In the later period women were threatened that if they miscarriedÂ theirÂ unborn child would neverÂ receiveÂ the forgiveness of Christ because they were never baptised and so THEY, the mother,Â wouldÂ be responsible.Â ThisÂ must have put theÂ grievingÂ mother whose pregnancy miscarried under even more distress. Late births had their own medical risks and an overdue woman would be getting very anxious. Advice which probably dates back to the pagan period was for a woman to leave her house,Â take a handful of milk into her mouth, spit it out into running water, swallow the running water and thenÂ visitÂ another house and eat something. This would be accompanied by a chant asking for a healthy birth. InÂ theÂ ChristianÂ period the woman was to visit a graveyard, step 3 times over the grave of Â a man and recite as she did it “let this be my protection against loathsome late birth, let this be my protection against miserable still birth, may this be my protection against loathsome deformities at birth”. Amulets, strings of beads, rings and copper boxes which may once have contained herbs have been found in the graves of women and babies (sometimes buried together) suggesting the use ofÂ physicalÂ items to ward off the dangers of pregnancy. There does not appearÂ to be any evidence of much use of surgery such as forceps orÂ caesareanÂ section Â in labour at this time. Reliant of dubious superstitions and remedies the actual birth of a baby was a dangerous time for a woman. If Â woman had a difficult labour they were advised to drink water in which parsnips have been boiled. If the baby would not come forth or died and needed to be expelled the woman was to drink dittany juice. This was rare and probably not native to Britain, being of Greek origins, and so unlikely to be available. 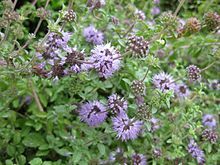 Â The Pennyroyal plant does grow here and interestingly is a uterine stimulant – in otherwords it would encourage a woman’s womb to contract and push out the baby and so that remedy for once has some basis in science. It was also used to induce an abortion if the woman did not want the pregnancy and as a result Pregnant women were advised against taking it during earlier pregnancy. An ineffective and rather difficult to obtain remedy for pain in labour was to drink wolf’s milk mixed with wine and honey. Quite how you were supposed to GET the wolf’s milk is not explained. Finally after the baby was born if the placenta or afterbirth would not come out the Leechbooks prescribed brooklime and hollyhock boiled in ale as a treatment. Illustrations from leechbooks dating from the later Christian period show women tending women in labour and it is likely that female relatives as well as Â actual midwives (womenÂ who became experienced and so were called in to help with labour) would be in the birthing room. Men are clearly NOT in the room in these images and childbirth was the domain if women. In the earlier pagan period it may have been different.Â ScandinavianÂ documents record the fact that often the father would be present at least at the birth or SOON after and would certainly come into the birthing room and be presented with the child. There seems to have been some ceremonial significance about him picking up the child/ taking it from the midwife as being the moment when he acknowledged the child as his own. As has been said labour and childbirth was a dangerous time for the Anglo -Saxons. How do we know? TheÂ cemeteriesÂ that date to this period provide the answer. FirstlyÂ almostÂ half of women buried in the Anglo Saxon cemetry at Raunds in Northamptonshire died between the ages of 17 and 25 – the likely time for childbearing. In the circa 7th century graveyard at Berinsfield in Oxfordshire Â the bodies of women underÂ theÂ age of 30 are considerably more that equivalent aged men. These graves also contain the bodies of Â many babies up to a few months of age as well as stillborn babies showing that life was full of danger for all involved in this process. Praying to the gods was part of this entire process. 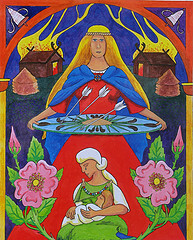 The two goddesses of importance in the process were Freya and Frigga (possibly the same figure). 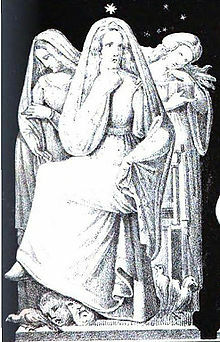 Freya was the goddess of fertility whilst Frigga had power over pregnancy and childbirth so both were invoked along the way and thanked afterwards. Our modern day Friday is named after Frigga. This belief was of course later replaced by attending church and giving thanks to God in the Christian period. This article draws much material for Childhood in Anglo-Saxon England by Sally Crawford and A Handbook of Anglo Saxon Food by Ann Hagen. This article came out ofÂ researchÂ I did for my Dark Age Novel The Amber Treasure and its sequel Child of Loki. It is presented in an Anglo-Saxon Survival Guide of similar material which all came from my reading and which I felt might be on interest to others. Continuing my discussion of arms and armour used in Anglo Saxon times I am lookingÂ at missiles. This material is adapted from Richard Underwood’s book Anglo Saxon Weapons and Warfare which I refered to when writing The Amber Treasure.Â It is recommended for those wishing detail on this subject. a)Javelin. Although spears could be used as a missile weapon, their bulk and weight would make them of limited value and certainly very restricted range. Lighter and shorter, the javelin was much more adapted for this purpose. From the account of the Battle of Maldon in 991 it appears that an exchange of javelins was a prelude to the main melee. Javelins had a range of perhaps 50 feet.Â Angons were a sub class of javelin with barbs on the head which would be difficult to pull out of a wound.Â One drawback to the javelin is the problem that your enemy could pick it up and throw it back at you. The Romans got round this problem in the construction of their pilums so that the heads would bend and buckle and be no use (but could be repaired after a battle). There is some suggestion in the Grettir’s Saga that the Anglo Saxons tried experiments with loosening the screws that held the head to the shaft but this was not very successful. Â b) The Bow. Finding of bows in the graves of the period is rare. Does this suggest they were not widely used? Probably not. It is more likely that wood and sinews that were used in the construction of bows would not survive well in the soil of England into today. Sometimes grave goods including bows do survive well enough for us to see what type of bows were constructed. Furthermore the sagas record the use of bows and in particular the Bayeux tapestry shows no less than 29 images of archers suggesting bows were is use.Â Most men would use bows in hunting and so theÂ use of the weapon would have been familiar. That said, a man encumbered with armour and shield does not make a good archer and so the bulk of an Anglo Saxon warband would not be bow armed for this practical reason. The arrow heads that survive show a variety of shapes suggesting the Anglo Saxons attempted to make them for different purposes just as later 100 years wars archers did. Thus we can identify broad lead shaped arrow heads, narrow points good for armour piercing and barbed arrows. Bows at this time period would haveÂ range of about 500 feet. Â c)The Francisca or throwing axe. The 6th century chronicler Gregory of Tours records the use of small, curved headed throwing axes by the Franks (after whom they are named, becoming in time the French). Very limited in range (about 40 feet), these weapons were used at close range to shatter shields and disrupt the shield wall before the final charge. Â d)Sling. 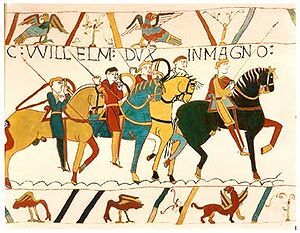 There is very little evidence of the use of the sling in warfare although one image in the Bayeux tapestry does show a man hunting with a sling. Â It is likely that men would carry a sling and stones for hunting and so it might on occasion be used in battle. In The Amber Treasure, Cuthbert is a superb archer and I give accounts of his and other skirmishers activities in battle. We know a considerable amount about the arms and armour used by the Anglo Saxons because firstly there is much mention of them in the sagas and chronicles such as The Battle of Maldon. Secondly weapons often survive well in archaeological finds being made, at least in part, of metal such as iron and steel. So then what weapons and armour were common at the time? Firstly I will consider weapons. Possession of a spear defined a freeman. A slave caught with one could expect a beating at the very least. Cheaper and simpler to make than a sword, they were therefore much more numerous. Commonly made of ash, hazel or oak with iron points and caps (ferules) these would be about 6 to 10 feet in length. A man using a spear would also hold a shield and typically fight in a shield wall with shields overlapping with his neighbours. As such a spear was used one handed. Reconstructions of fighting techniques suggested by Richard Underwood in his book Anglo Saxon Weapons and Warfare suggest two primary methods of using a spear. You can use it over arm â€“ held up high with the arm extended and the spear pointing downwards. Used this way you could try and attack over theÂ enemy shield against head and neck. Or you could use it underarm with the spear braced along the forearm. This was more defensive and was good for parrying the enemy spear and pushing against his shield to keep him away but was not much use offensively. Just as possession of a spear defines a freeman, owning a sword suggests a man had wealth or nobility. This is because swords take much longer to make and are much more expensive. Most Saxons swords are pattern welded. This involved starting with two to five rods of steel or iron which are formed into bars, welded together, twisted and then hammered flat. This process created strength in the final weapon. Then an upper guard, grip and pommel were attached made of wood, metal or bone. A number of swords were found with runes and markings usually identifying an owner. This was actually the weapon from which the Saxons derived their name. It was a short one edged blade â€“ really a long knife about the size of a modern large kitchen knife. This was not designed as a primary combat weapon but it seemed likely that every man and most women would carry one as it is a useful tool.Â There are images and mentions in sagas suggesting use in hunting such as dispatching a wounded animal. In battle it would be a last ditch weapon to be used in desperation. Long shafted and short shafted axes were tools used mainly for felling trees and working timber. Their use in battle was limited because of several draw backs. The shaft being made of wood was vulnerable to enemy swords. A man might seize the shaft and pull it out of an enemy’s hand in the way that you could not with a sword. Finally the cutting edge was much shorter than that of a sword which meant it could not cut as deep or as long. The head of an axe was however heavy and in the hands of a strong man would make a brutal weapon as evidenced by tales of a single Viking axeman at the Battle of Stamford Bridge in 1066 holding up an entire army as he stood on the narrow bridge. Next time I will look at missile weapons and go onto armour and shields. Most of the material in this blog is drawn from material in Anglo Saxon Weapons and Warfare by Richard Underwood. The use of weapons and battles features highly in The Amber Treasure my story of Dark Age Northumbria. The telling and guessing of riddles was a popular pass-time for the Anglo-Saxons. Often theseÂ riddlesÂ had double meanings – a blatantÂ sometimesÂ sexual one and a more subtle true answer. Â The riddlesÂ becameÂ steadily more elaborate and some are very obscure. 1.Â Head down, nosing-I belly the ground.Â Hard snuffle and grub, I bite and furrow. Drawn by the dark enemy of forests, driven by a bent lord who hounds my trail. Who lifts and lowers me, rams me down. Pushes on plain, and sows seed. I am a ground-skulker, born of wood. Bound by wizards, brought on wheel. My ways are weird: as I walk one flank Of my trail is gathering green, the other Is bright black. Through my back and belly a sharp sword thrusts; through my head. A dagger is stuck like a tooth: what I slash falls in a curve of slaughter to one side if my driving lord slaves well. 2. I saw a creature with its belly behind huge and swollen, handled by a servant, A hard, muscled man who struggled so That the bulge in its belly burst through its eye: Its passion–gorge and spill through death, Then rise and fill with second breath To sire a son and father self. 3. A small miracle hangs near a man’s thigh, Full under folds. It is stiff, strong, Bold, brassy, and pierced in front. When a young lord lifts his tunic over his knees, he wants to greet with the hard head of this hanging creature the hole it has long come to fill. 4. The wind carries small creatures over hill-slopes and headlands: dark coated, black-bodied, bursting with song. They chirm and clamor like a troop on wing, winding their way to wooded cliff-walls, sometimes to the halls of men-singing a name-song. 5. Who am I who stand so boldly by the sea road: hightowering, cheek-bright, useful to men? 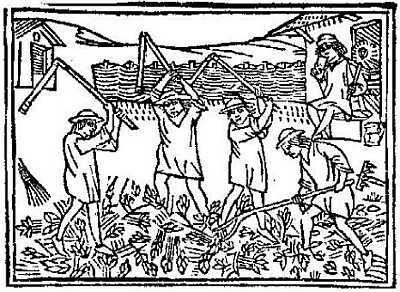 Harvest time was a very important and serious point in the year associated with rituals and thanksgiving after it was completed. There was no Asda or Wallmart to go to. OurÂ ancestors lived much closer to and were far more dependant on the land than we are today. These included wheat, barley and corn. Grain crops would be harvested and then taken to barns. Here there were thrashed with wooden or metal flails to bring off the grain. This winnowing was done on the floor of the barn in the early winter. 2.Saddle querns: These consisted of an upper convex stones and lower concave or hollow stone. The two halves would fit together and by rocking the upper stones the grain was crushed. 3. Rotary querns with handle. These were two flat stones. Both round in shape which would rotate one upon the other. 4. Mills were introduced in 8th to 9th centuries. The mill stones were powered by water wheels or by animal power. Animals were typically killed in the winter as meat was easier to store in the cold months than the heat of summer. Because of the greater risk of infection pork was never eaten in the summer. A smaller household might employ a professional to slaughter their animals. Animals would be killed using the spike on the rear face of an axe â€“ this is the origin of the expression ‘poleaxeing’. Â This butcher would usually be paid in meat from the animal. 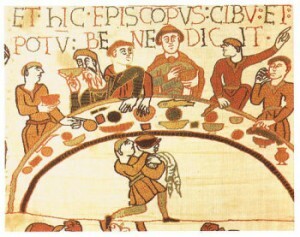 Meat was usually hung for up to 3 weeksÂ for beef or 1 week for lamb. Most of an animal would be used for food including the tongue, offal and brain. Even bone marrow was used in salves and ointments, soups etc. This was done in the sun, in open air, by a fire, in an oven or in a kiln. It was used for beans, cereals, herbs, mushrooms (threaded on string), seaweed, peas and even some meat and fish. Birchwood, oak, juniper wood or even seaweed was used to smoke hams, and some fish such as herring. After salting the pork or ham might be smoked. How was food stored through the winter? Fruit: Boiled and the put in a crock jar sealed with greased lid – maybe using butter or wax. The food would be locked away in a store room. The room was locked and the key kept by a key holder. This was a very important role. It was usually a woman. Sometimes women were buried with their keys and have been found by archaeologist which is how we know about this. Other than lack of refrigeration, pests were a real problem. These might include mice and Â rats. The Anglo Saxons kept cats and even weasels Â to keep the mice and rodent population low. Flour and cereals could get infected by flour mites causing bowel disorders like diarrhoea. No Ipods, no Internet, no TV, radio and not even newspapers and books (unless you were wealthy ). What do you do to keep from getting bored? Here are some ways that the Anglo Saxons had fun in the dark evenings. The Anglo-Saxons were fond of dice games. Dice were made from the knuckle bones of animals such as pigs. Boardgames were also popular and often recalled battles in a symbolic way. An example is Hnefatafl which is played using stone pieces on a carved wooden board. Â One player’s pawns coming from the corners of the board would attack the other side’s kings and pawns which were positioned in the centre. The player with the King would be trying to get him off the board (to escape from the battle) whilst the other player would try and trap him. 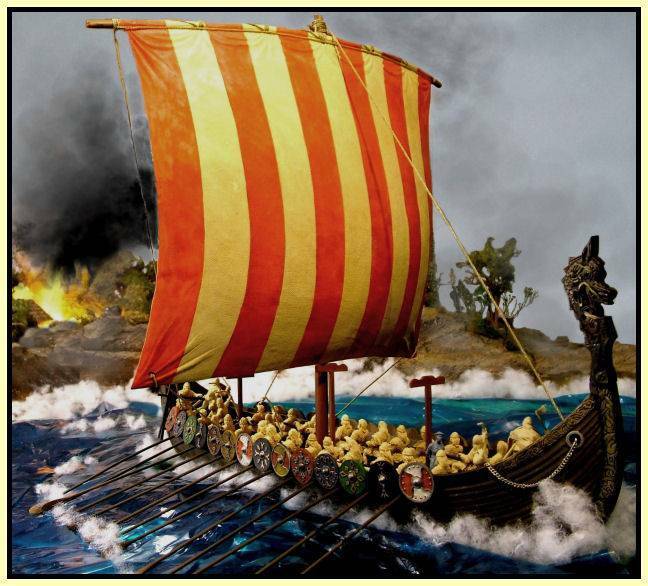 These un-even games â€“ where the two sides were of different sizes and abilities â€“ were very prevalent in Anglo-Saxon and later Viking cultures. Horse racing Â was mentioned in BeowulfÂ in 8th century and by the writer Bede in 7th. There are records of dog racing, hunting, ice skating, swimming, falconry, hawking, acrobatics wrestling and gymnastics.